If you want to know which is best, a swing, rocker or bouncer, click here to read about them. Here I’m going to look closely at the best baby swings on the market to compare and contrast and find out which one really is the best baby swing of 2018. 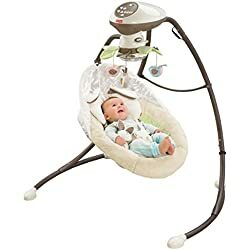 A baby swing is an apparatus with a large base and a seat suspended from the top, which moves in different directions electronically using either batteries or electricity. They are more hi-tech than bouncers and rockers, so they often have different options including music, nature sounds, vibrations and a variety of swinging motions, depending on the model and brand. How to choose a baby swing? The utmost important thing to consider when choosing a baby swing is safety. Swings should have wide, sturdy bases for good stability, a narrow base risks toppling over and causing harm to your baby. The seat should also hang reasonably low down, as the closer to the floor, the better, because this, along with the wide base, makes a swing stable. Finally, a safety harness is a must for any kind of baby seat, but especially a swing which intended to move about with baby inside. Although they are general very safe and manufacturers must take into account all safety precautions and pass certain tests, you should always verify that the swing is correctly assembled and that baby is safely fastened in. Some swings simply swing your baby back and forth, while others have melodies, nature sounds, vibrations, toys, mirrors and many other things to both entertain and soothe a baby. Often, the higher the price tag, the more functions available, but you should consider what exactly you need; is it simply somewhere to put your baby while you complete tasks or do you want a swing to lull your baby to sleep for naps? Your baby might use this swing severl times a day, so it ought to be comfy! A comfortanels wing seta for a newborn is usually encompassing, in order to give the impression that the baby is well proetced and surronded on all sides like they were in the womb. If a swing isn’t convenient for your lifestyle then you won’t use it and will regret buying it, which make sit a huge waste of money. 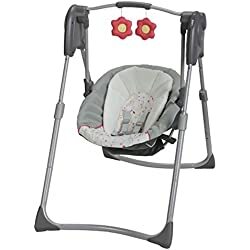 A practical baby swing should be easily cleaned, which often includes a removable seat cover which is machine washable. You do’t want to scrub a seat with a wet cloth and then let it dry, when you coud simply toss it in the washing machine. If you need to move the swing from room to room, don’t buy something heavy and bulky. The little details like these are important to think about, to make life as a new parent run more smoothly. For some parents this is a minor details, for other it’s a deciding factor. Do you want a plug-in electricity powered swing, or a battery-powered swing? Some swings use an AC adapter while others uses batteries-only, and then there are those which allow yo to do both. Batteries can be used up quickly and need changing often, which can be quite pricey, yet they’re great if you don’t have a plug socket nearby, so you can turn the swing on anywhere without limitations. Ok, toys aren’t a necessity, but I’m including it as something to look out for because toys are not only made to keep babies and children amused: they are there to help them learn. Some swings provide simple plush toys, while others include special qualities to stimulate baby’s senses, like sounds, patterns, mirrors or different textures. These help towards your baby’s learning and development, so if you’re going to buy a baby swing with toys attached, they might as well serve a purpose. If you pop baby into the swing to do odd jobs and chores ad he or she doesn’t want to sleep, it’s good to have some toys to keep them entertained to they don’t start to fuss. Of course you may already have plenty of toys and need a swing simply to rock your baby to sleep or sit him down, and in this case, toys aren’t a priority, they’re simply an added bonus. This is the best baby swing available on the market right now based entirely on my own opinion, (although many other parents share this opinion, best it’s a pretty incredible swing!) So, I would be a fool not to show you this one first. If you’ve done any prior research into the best baby swings I’m sure you will have already come across this product, it’s the Mamaroo by 4moms. It is not only a super smart swing, but it is also used in hospitals because of it’s unique movements. This swing is slightly different, ad could simply be considered a baby seat, because there is no swinging seat suspended from the top. there is a base and a seat, but it has the variety of movement of a baby swing rather than a standard seat or rocker. Many swings nowadays have the choice of 2 swinging motions, back and forth and side to side, but the Mamaroo has a enormous 5 motions! This is so that it can imitate the true movements of a parent. Something I personally love it the car-ride motion, as so many babies fall asleep so easily during even the shortest of car rides. Instead of wasting time and gas in the car, not to mention the unnecessary pollution, yo can simply put your baby in the Mamaroo and it will imitate the car journey movements. This baby swing uses bluetooth, meaning that you can control the movements, speed, music an d volume from your smart device. the swing has built in music for yo to choose from, but you can also use your smartphone or music player using the MP3 plug-in, allowing you to choose literally any music or sound that you, and more importantly, baby, like! The seat reclines to any position including full recline and the seat fabric is easy to wipe down but is also removable and machine washable for extra convenience. There are 3 toys provided to keep your little one stimulated and entertained, a rattle, a mirror and a crinkle ball, which are all reversible. I personally love this swing as it’s so modern and technologically intelligent, but it is loved by many others as well. It is used in more than 350 hospitals across America in their NICU and pediatric units because NICU babies are irritable and when they are distressed they often need to feel the comfort of their mother’s womb. Firstly, it soothes babies by englobing them giving them the comfort they felt in the womb, and secondly, it mimicking the natural motions of their mother. This swing is available in 4 colors, from simple black (click image above to see more) to colorful shapes. There is an infant insert for your newborns available in plain or multi-colored sold separately. 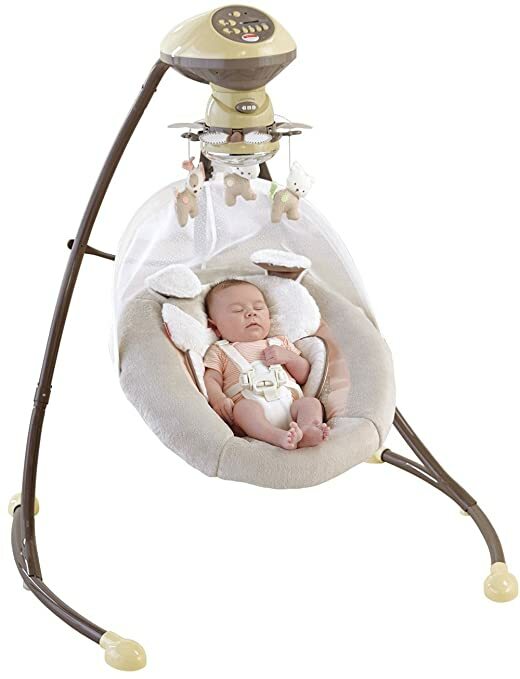 This teddy bear themed swing in neutral colors is the My Little Snugapuppy Cradle ‘n Swing. It is a great Fisher-Price swing which can be used both with batteries or plugged in to mains electricity. It has 2 choices of swinging motions; the classic back and forth swing, but also side-to-side to replicate a cradle movement. The seat has 2 reclining positions and with the simple push of a button it can be turned to faced left, right or centre. There are 6 swings speeds and an enormous 16 musical melodies including nature sounds, to both entertain and soothe your baby. The control panel is on top of the swing so it is easy to access . The seat cover is machine washable and there is an infant insert and a head support included. The mobile includes soft toys and a mirrored globe to stimulate baby’s senses, and a teething toy is included. This Fisher-Price swing is suitable from birth up to 25lbs. It comes in all different colors and themes, including adorable birds, owls, moonlight meadow and a cute ballerina theme. I’m going to show you two very different Graco swings, one at the cheaper end of the market, which focuses on simplicity and another more complex design with more advanced technology, both raved about by parents, and great for different purposes. Firstly, the Slim Spaces Compact Baby Swing, its name alone explains its main selling point: it’s slim and compact, ideal for small houses or apartments. The legs are adjustable so that you can change the height accord ing to your needs. This swing is battery operated and lightweight, a combination which makes it ideal for carrying around from room to room and also for easy transportation, meaning it is a great travel swing. It also has a carry handle and compact size when folded to make it even easier. It swings back and forth using battery power and can be used up to 25lbs. This swing has no fancy frills or technology, but the height adjustment allows play and interaction with baby wherever you are, it functions without problems and is a compact and low cost baby swing. 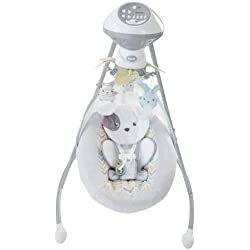 The other Graco baby swing which I love is in the sub-category below as it functions as both a baby swing and a rocker. 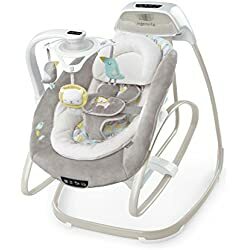 The Graco DuetSoothe Swing and Rocker is a great 2-in-1 rocker and swing, where the rocker can simply be detached and carried around the house with the convenient handle, so that baby stays close to you at all times. The seat reclines to find a comfortable position for your baby and can also swing while facing in 3 different directions; left, right or centre. There is a choice between the classic back and forth swinging motion or the cradle style side-to-side sway. There are 6 swinging speeds to find the perfect speed for your baby, and there is the option to turn on vibrations to soothe babies that need lulling that little bit extra. There are 10 melodies as well as 5 nature sounds to find a tune to calm your little one during nap time and and stimulate them at playtime, aided by a three-toy mobile to keep them entertained. Hou have the choice to plug-in or use batteries. There is a 5-point harness for security. The seat pad can be machine washed on a cold, delicate cycle. 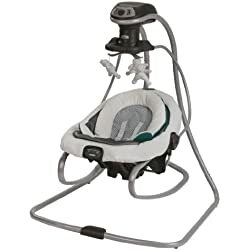 Parents love the versatility of this product, being able to move around the house easily with the rocker and use as a fully functioning swing at no extra cost, however, some parents criticize the motor lifespan. For our reviews of baby rockers and bouncers, click here. I really like this swing from Graco, which reminds me of the Mamaroo but a more simple version. I have only seen it in the UK so I’m not sure if it’s available worldwide or not. The Move With Me swing folds in half which is extremely practical for storage. It has 2 recline positions, 5 speeds for the sideways swinging motion as well as 2 vibrations speeds. It plays 10 songs and 5 sound effects, but you can also attach your own personal device using the MP3 adapter. The seat is very comfortable and has a 5 point harness with a buckle cover for comfort and safety. Graco is a trusted brand and this, like their other products, is a safe and sturdy swing which provides both comfort and entertainment for your little one. Finally, this swing has a built-in carry handle, which makes keeping an eye on your baby a whole lot simpler, as you can move hm or her from room to room with you. The Swing ‘n Go Portable Baby Swing is one of Ingenuity’s cheaper models, but is still a high quality swings with several functions. There are 8 melodies and also 3 natures sounds to choose from to soothe your baby to sleep, and there is even an auto shut-off after 30 minutes. there are 5 swing speeds with automatic shut off after 30, 45 or 60 minutes. There is a toy bar with 2 plush toys for added entertainment which moves easily out of the way with one hand so that you can easily access your baby to get him/her out and put them in. A major selling point for this swing is the WhisperQuiet technology which lets baby sleep peacefully without the wurring of a noisy motor, which can be a nuisance for parents as well. It uses HybriDive technology which preserves battery life, allowing you to use it for up to 3 times longer than standard battery-powered swings. this swing folds for easy transportation with it’s SlimFold design. The seat pad and head support are machine washable. The style of this baby swing is modern and neutral in grey tones. Regarding transportation, parents wish it had a travel case but love that it’s lightweight and easy to carry. It is entirely battery-powered so there is no option to plug it in. I believe that you don’t need to spend a ton of money in order to find a great, high quality product, but with baby items there are often more functions and more features available with more expensive products, especially when it comes to technology. Ingenuity also created the SmartSize 2-in-1 Soothing Solution which is another swing and rocker ensemble, which converts one one to the other in a matter of seconds. The compact design saves space without compromising on baby’s comfort. 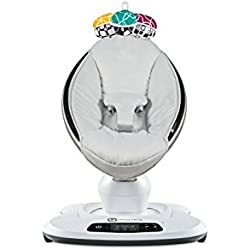 you can connect your smartphone to the swing using the ConnectMe feature in order to play music or videos and show images to your baby. The electronic mobile has moving toys and light beams to stimulate your baby’s senses. Ingenuity’s WhisperQuiet technology makes this swing almost silent, so there is no annoying motor noise to disturb baby or get on mommy and daddy’s nerves! You will always be able to keep an eye on your baby with the 360 degree rotation. There are 6 swings speeds and 3 timer settings for automatic shut-off. 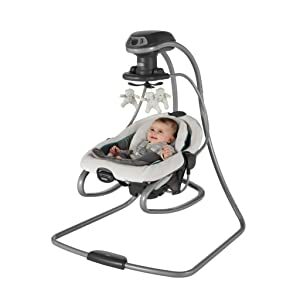 This vibrating baby swing uses modern technology to mimic waves, a heartbeat or a car ride as well as standard vibrations, which all help to soothe and calm your little one. You can select one of 8 melodies or 3 natures sounds to find a tune that baby adores. The seat reclines to 2 positions and there is a head support and an extra infant bolster for maximum comfort even for newborns, both the head support and infant support are machine washable. There are wheels on this swing to easily move around the house and the frame is lightweight. you can choose between battery power or plug into the mains electricity with the AC adapter. Parents say this swing is great because it is both lightweight, for easy movement, and stable, so they don’t have to worry about it toppling over. It’s easy to use and they love that it can be so easily switched from a rocker to a baby swing.